Yarrr, there be good people in the town of Bluebell, Alabama. 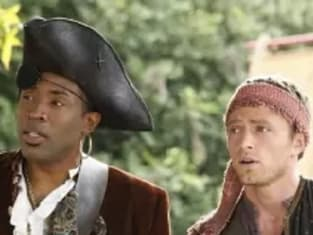 Me thinks "The Pirate and the Practice" was an enjoyable episode of Hart of Dixie, even if relied on one-dimensional caricatures of George's parents to make a point about small town loyalty and compassion. Seriously, could the show have painted a more unrealistic portrait of two parents? Give it points for consistency, at least, as I made the same complaint when we first met the Tuckers in "In Havoc and In Heat." I wish the writers would take more time to come up with layered characters, to rely on subtle references and moments, instead of clobbering us over the head with two utterly dislikable, over-the-top individuals. But, hey, at least they made Lemon seem downright open-minded and friendly by comparison - and... wait for it... that's a haaaaard thing to pull off. Overall, though, the most booty-ful aspect of the episode was how it has allowed me to use as many pirate-related puns as possible. And also how it gave a bit of backstory to Bluebell. Sure, it's cute and humorous that the town has so many odd traditions, but it's even more welcome when those traditions represent a larger picture, explained in this case by Brick's tale about the hurricane and the fish and the community's efforts to rebuild over the years. Aye, I be a softie. What can I say? Meanwhile, if Mr. and Mrs. Tucker belong at the bottom of Davy Jones' Locker, Wade continues to be the sort of matey that a lass such as Zoe would be lucky to date. No, not just do. To actually date. Come on, how many men out there would willingly blow their own fuse box just to have a few moments alone with their crush? Thar be the sort of sweet gesture that makes it clear Wade is no scallywag. He's after the most important booty of all. Not actual booty. This man's treasure of choice is Zoe's heart and he should be grateful that a first mate such as Lavon is there with a map of how to navigate such dangerous waters. I also enjoy the burgeoning respect between Zoe and Brick. 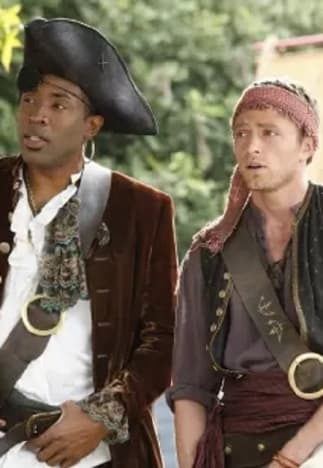 This is growing into a healthy, friendly rivalry - think Magic and Bird; Federer and Nadal; Captain Jack Sparrow and Barbossa - but a rivalry nonetheless. I'm glad. It would show a lack of progress if they simply hated each other, and it would become boring if they always got along. So the next quarter has already begun for Dr. Hart, while a superstore is going up outside of town. This show may never shock me into screaming "shiver me timbers!" at the conclusion of any episode, but a few ongoing storylines are being planted, sort of like how a pirate plants a skull-and-crossbones flag on any island he pillages. Yo-ho-ho, life in Bluebell can be ahoy to behold.